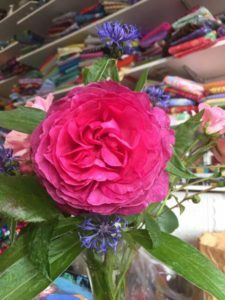 Kaffe and I are re-grouping back at the London studio after our break, and the garden is bursting with new growth including the Kaffe Fassett rose blooming in all its glory. Because of Customs and the Laws, it is taking time to propagate the Rose in the US and Europe. Once I have news on its availability I’ll whistle from the roof tops. Whilst Kaffe was visiting California, he stopped off to give a lecture and tour of his exhibition at the San Jose Quilt Museum which ended on the 28th June after a three month run. The antique quilts on loan from the British Quilters Guild return to the archive in York. 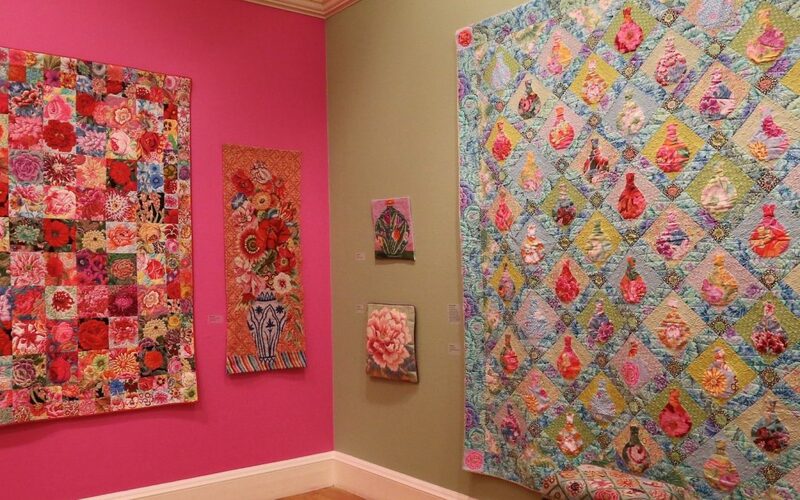 The quilts made in the Kaffe Collective fabrics travel onto a show at Hancocks of Paducah this November. On July 11th, the UK’s University of Huddersfield is honoring Kaffe with a doctorate award. Some of you may have heard that there has been internal changes within The Coats company; who own Westminster Fibers. The company had a big shake up and sold their European Division, which included Rowan Yarns. Rowan is now owned by a company called Mezcrafts. Though information on Rowan can be found at their website. Mezcrafts and Rhinetex (based in Holland) will be distributing all of the Kaffe Fassett Collective fabrics including the Shot Cottons and Indian Stripe fabric for Europe. If you have any questions, the best place to look is Coats new fabric web site www.freespiritfabrics.com. The middle of August we will have a large presence at the Festival Of Quilts, Birmingham where Kaffe has been invited to exhibit a selection of antique quilts from his own private collection from the last 30 years. 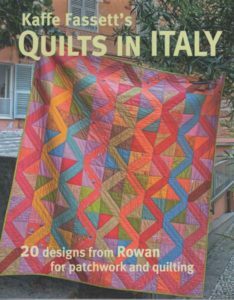 Alongside this exhibition, we will have the Quilts from our latest book ‘Quilts in Italy’, which we photographed with our wonderful friend and photographer, Debbie Patterson in Cinque Terre, Italy. 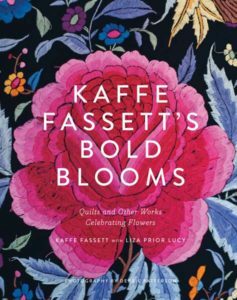 Also, we will be pre-launching and signing 500 copies of Kaffe latest coffee table book Bold Blooms published by Abrams. ‘Bold Blooms’ has been a labor of love, taking over 4 years to produce. It is a book Kaffe dreamt about doing for a long time. 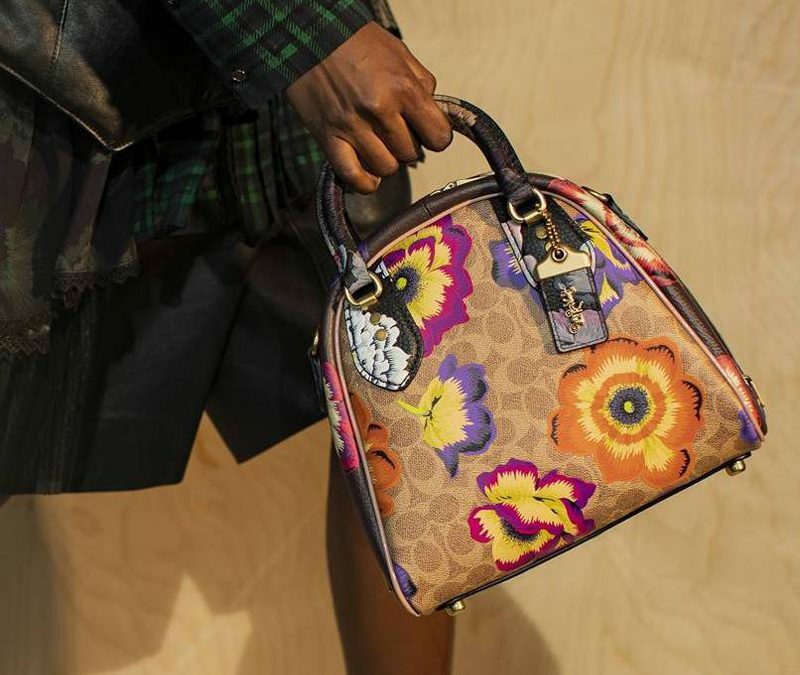 It shows how Kaffe takes his inspiration from the world of flowers and uses it in design and his patchwork designs. There is a needlepoint project at the end of each chapter as well to keep you busy. Both books go on general release mid September. Also at the ‘Festival of Quilts’, Kaffe will be giving the ‘Soup and Supper’ talk with a highly visual slide lecture giving you an insight into our methods and inspiration. 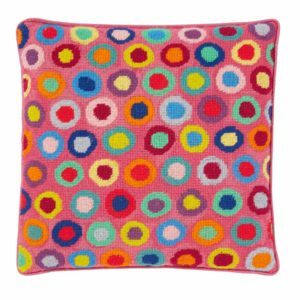 Both Kaffe and I have done a few new bright geometric needlepoint designs for Ehrman Tapestry catalogue, including a sharp ‘Tumbling Block’ design and a bold ‘Bordered Diamond’ layout from Kaffe, plus a Bright Rings needlepoint design from myself. 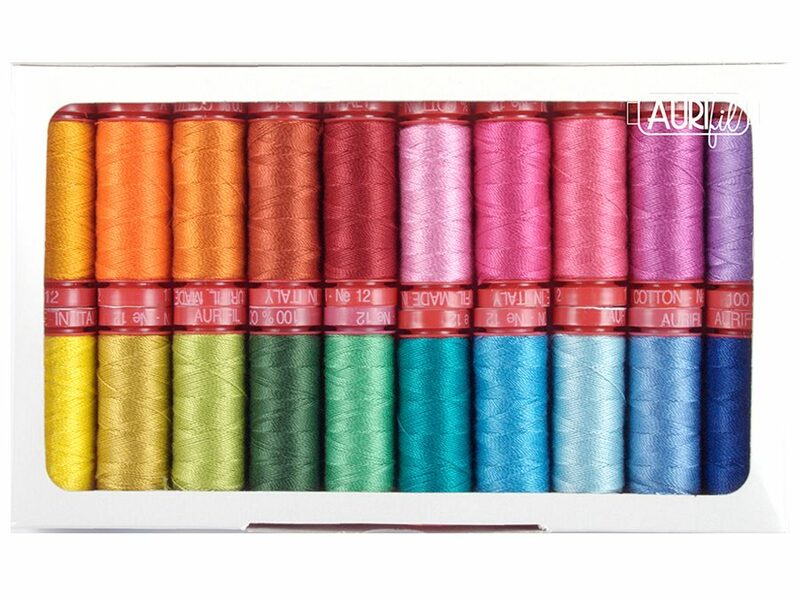 The only patchwork classes we have scheduled in the UK for the rest of this year are with Lady Sew and Sew, in Henley On Thames, an hour out of London in early September and a ‘Colour in Design’ knitting workshop by myself in November. In the mean time, Westminster Fibers are planning a six week back to back workshop tour of the USA starting with 3 workshops in NY with ‘Quilters take Manhattan’ and ending the tour at Houston Quilt Market with 3 classes assisted by our design colleague Liza Lucy of www.gloriouscolor.com, whilst I’m hosting two classes and a lecture in Lyons, CO. Once I have more info on the tour, dates and contact info will be posted on our websites. As Rowan will be celebrating their 60th edition of the Knitting & Crochet Magazine, Kaffe will be helping the team celebrate at their Anniversary event at Gardens of the Rose in Hertfordshire on 15th August – more details to follow on our events page on the website later. In the mean time, I send you with all good thoughts and will catch up in early Autumn with what’s new – and do we have some treats to tell you about then too! Whist the world politics are so turbulent, thank goodness we have the distraction and stimulation of our creative time – Amen !